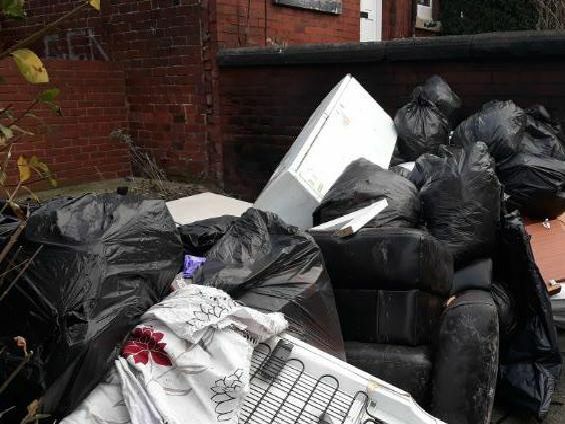 These are the shocking photos that show the extent of illegal flytipping in Leeds. The images were all taken by the council's Clean Leeds team during January street cleaning operations. Since May 2016, councils have had the power to impose fixed penalty notices (FPNs) for small-scale fly-tipping offences under new legislation introduced by the government. A child's car seat is among the rubbish dumped on a terraced street in Harehills. Furniture and white goods have been dumped on the street. Discarded timber dumped by the side of the road. A flytipped sofa in a residential area.